Over the past 40+ years, Blank Aschkenasy Properties has built a record of successful investments and developments by applying our core principles to our real estate strategy. It’s our ability to think across the full spectrum of a project that sets us apart –prior to committing to any project, large or small, we embark on an intensive due diligence process that results in us always being several steps ahead of our competition. We consider the issues most likely to arise, the impact one decision will have on other parts of a project and, most importantly, work to resolve them before they become a stumbling block. And when the unexpected occurs, we take a rigorous, hands-on approach that we believe is generally successful because of our deep knowledge of our markets, vertically integrated operating platform and proximity to our real estate investments. We have been in the real estate management business in the Philadelphia area since 1972. We actively manage our own properties and take great pride in our relationships with our tenants. Fundamental to our success is the success of our tenants. We invest our capital side by side with our partners, ensuring that our interests are always aligned. We prioritize value add opportunities where we have a specific expertise or local knowledge that provides us an advantage over our competitors. We believe that re-development of new acquisitions (as well as management of our existing properties) is a collaborative effort with the community that the project serves, and accordingly, take our role in each community extremely seriously. June 2018—Relative Properties is pleased to announce the addition of Riverquick Apartments into Yardley Crossing. By adding the adjacent units, the acquisition provides both operational economies of scale to both properties and adds value to the new units by providing access to Yardley Crossings extensive amenities. May 2018— Blank Aschkenasy Properties is pleased to announce that Oak Street Health will be opening its first Northeast Philadelphia location this fall at Aramingo Square at the corner of Castor and Aramingo Avenues. November 2017— Bryn Mawr Village, an outstanding infill redevelopment project in Lower Merion Township, received a 2017 Montgomery Award from the Montgomery County Planning Commission for creative vision, effective site design, and successful collaboration. 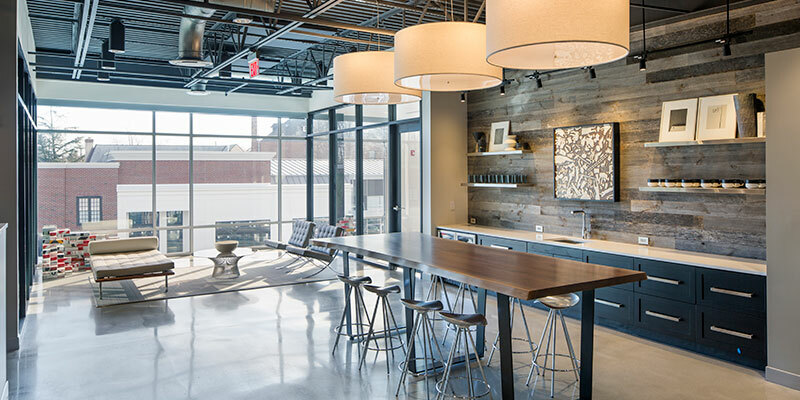 This impressive adaptive reuse project, a result of decade–long planning efforts and development initiatives, transformed a vacant, underutilized site located in the heart of the Bryn Mawr business district into a vibrant mixed-use center.